Album includes CD & DVD. Jonathan Larson’s career was brief and intense. Like the characters he created so vividly for his Pulitzer Prize-winning Rent, Larson radiated a great vitality and sense of purpose. Engaging and warmly gregarious, he also possessed a sharp wit and keen sense of irony. 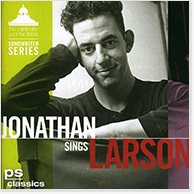 JONATHAN SINGS LARSON uses Larson’s own demo recordings (for which he used the newly-evolving mediums of computer and keyboard synthesizer to create performances far more elaborate than the usual songwriter piano-vocal demos) to reveal the range and gifts of a songwriter who was just fully realizing his potential at the time of his death. Besides familiar numbers from Rent and tick, tick…BOOM! included are several songs that have not been widely heard, songs that further showcase Larson’s gift for inventive melody, character and novel situation. Also included: a bonus DVD with four video tracks from his November 25, 1991 performance at New York’s Village Gate.